If you have recently been involved in a car accident in florida, one of the most important things to understand is the state’s no-fault insurance structure, which means you must first go through your own car insurance coverage in order to receive compensation for your injuries or any lost income. 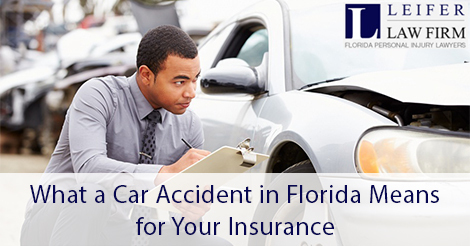 Since Florida is a no-fault car accident state, you have to contact your own insurance company immediately after a car accident in Florida. Make sure to contact your insurance company immediately after the accident. There are some situations, though, where you might receive all the benefits you can from your insurance without being able to cover all your bills. Can We Ever Step Outside of the No-Fault System? There are situations in which you may step outside of the no-fault system and pursue a legal claim against the at-fault driver, if your injuries are permanent and severe. If significant and permanent loss of bodily function is one of the impacts you have sustained from the crash or if you have significant and permanent scarring or disfigurement, you may be eligible to pursue a claim outside of your car insurance company. Your personal injury protection claim is a claim that you make with your own insurance company to pursue payment of lost earnings and medical bills. Your insurance company should pay for your medical bills and then reimburse you for a portion or all of your lost earnings up to the total amount of the claim. It is important for you to cooperate with your insurance company when you have a personal injury protection claim in the works. You may have questions about protecting your rights and what to do if your insurance company is difficult to work with or if you believe they are minimizing the impacts of your injury. In these situations, it’s imperative to consult with a Florida personal injury attorney about your vehicle accident. Only an attorney can advise you when your case needs to go outside of Florida’s no-fault system and how you can pursue additional compensation, if necessary. It can be shocking to learn that the total amount of your medical bills after a car accident can be much more than you expected. This can change your life in big ways and can put additional stress and pressure on you, particularly if it has already been a challenge for you to return to work. Gathering all of the evidence associated with your Florida vehicle accident claim and any communication with your insurance company is strongly recommended before you set up a meeting with a Florida car accident lawyers. The pain you suffer post-accident has the potential to really change your life. What if, for example, you can’t go back to work? What if you need a loved one to help you get through the day because the pain is so severe? What if you will never be able to participate in certain activities again because your injuries prevent you from being able to? A car accident attorney will review the materials associated with your claim and help advise you about potential next steps. It can be overwhelming to find yourself in the position of negotiating with your insurance company and trying to illustrate the true and severe nature of your injuries post-accident. Having a Florida car accident attorneys to help you through this process and to advise you about recommended steps as well as common pitfalls other people have faced can be extremely valuable. Do not hesitate to reach out to a Florida car accident lawyer if you believe that you need more advice about a personal injury protection claim. Understanding how Florida’s no-fault system works and how your insurance company may be involved in the aftermath of the car accident in Florida is a burden you do not have to handle all on your own. Your Florida car accident attorney can help you negotiate this difficult process.